Speedometer does not receive signal from the vehicle speed sensor for more than 6 sec. When the motorcycle is running. 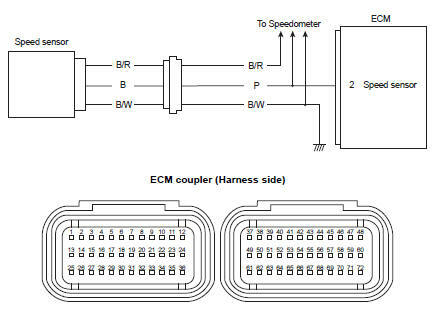 Ecm does not receive signal from the vehicle speed sensor for more than 6 sec. When the motorcycle is running. Failure in communication between ecm and speedometer with reference to vehicle speed. 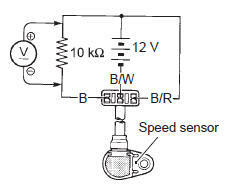 Speed sensor circuit open or short. Check the speed sensor coupler (1) for loose or poor contacts. If ok, remove the speed sensor. Refer to “speed sensor removal and installation” in section 9c . Connect 12 v battery, 10 kΩ resistor and the multi-circuit tester as shown in the figure. 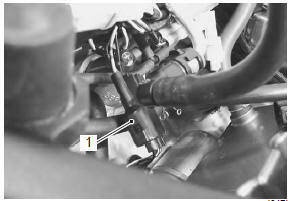 Under this condition, if a suitable screwdriver touching the pick-up surface of the speed sensor is moved, the tester reading voltage changes (0 v → 12 v or 12 v → 0 v). If the tester reading voltage does not change, replace the speedometer sensor with a new one. while testing, the highest voltage reading should be the same as the battery voltage (12 v). P wire open or shorted to ground. Loose or poor contacts on the speed sensor coupler or ecm coupler (terminal “2”). If wires and connection are ok, intermittent trouble or faulty ecm. Inspect that metal particles or foreign material stuck on the speed sensor and rotor tip. If there are no metal particles and foreign material, then replace the speed sensor with a new one.